The Hemingway Hero is defined by a static set of characteristics. These characteristics remain essentially the same throughout all of Hemingway's works. 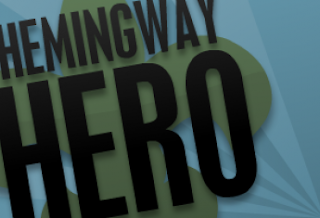 The Hemingway Hero is always courageous, confident, and introspective. He does not let his fears get to him. The Hemingway Hero is expressed differently in each of his novels, though. Sometimes he is young, and sometimes old. In Hemingway's novels “The Nick Adams Stories” and “The Old Man and the Sea”, the Hero is introduced differently. In “The Nick Adams Stories”, Nick Adams begins as a naive, young boy then becomes the Hero within the view of the reader as his early life and the events that influenced his life most are the entirety of this memoir-style novel. In “The Old Man and the Sea’, though, the old man does not develop into a hero. Santiago begins as an old man who has already attained the Heroic qualities that he will demonstrate intentionally throughout the rest of the story. This is a unique and remarkable approach, and after the failure of his previous book, certainly a risky one. The book is not a portrait; it is not static, despite that the main character's morals – his ideals- never really change. A reader of his previous works might feel that they have seen these characteristics in Hemingway's works before. Nick, the main character in “The Nick Adams Stories”, is in many ways is like Hemingway himself. Setting up camp and fishing and cooking by himself, Nick lifts his spirits by creating his own personal utopia. He remains and is static, unchanging example of Hemingway's idealistic of heroism. In fact, Nick Adams is probably the most autobiographical of Hemingway’s characters. Instead he relied, like Nick Adams, on finding his own escape from reality, making his own “good place”. Like Nick Adams, Hemingway found nature to be the best escape for him from his troubled world. The "Hemingway Hero" was not an original invention of his. The Hero, universally, expresses one key quality: Grace Under Pressure (GUP). Nick travels into the forests of northern Michigan to find a release from the agony and emotional wounds the war has left him. Closely related to the concept of stoicism is the "Code Hero," a phrase used to describe the main character in many of Hemingway's novels. Some critics regard Santiago as the finest, most developed example of these code heroes. In this phrase, "code" means a set of rules or guidelines for conduct. In Hemingway's code, the principal ideals are honor, courage, and endurance in a life of stress, misfortune, and pain. Often in Hemingway's stories, the hero's world is violent and disorderly; moreover, the violence and disorder seem to win. The "code" dictates that the hero act honorably in the midst of what will be a losing battle. In doing so he finds fulfillment: he becomes a man or proves his manhood and his worth. The phrase "grace under pressure" is often used to describe the conduct of the code hero. Hemingway defined the Code Hero as "a man who lives correctly, following the ideals of honor, courage and endurance in a world that is sometimes chaotic, often stressful, and always painful." He measures himself by how well he handle the difficult situations that life throws at him. In the end the Code Hero will lose because we are all mortal, but the true measure is how a person faces death. He believes in "Nada," a Spanish word meaning nothing. Along with this, there is no after life. The Code Hero is typically an individualist and free-willed. He never shows emotions; showing emotions and having a commitment to women shows weakness. Qualities such as bravery, adventuresome and travel also define the Code Hero. Ironically, the code hero can also be afraid of the dark in that it symbolizes the void, the abyss, the nothingness (nada) that comes with death. However, once he faces death bravely and becomes a man he must continue the struggle and constantly prove himself to retain his manhood. The code hero or heroine (like Catherine Barkley) must perform his or her work well to create a kind of personal meaning amidst the greater meaninglessness. Still, life is filled with misfortunes, and a code hero is known by how he endures those misfortunes. Ultimately, the code hero will lose in his conflict with life because he will die. But all that matters is how one faces death. In fact, one should court death, in the bull ring, on the battlefield, against big fish, because facing death teaches us how to live. Along with this, the code hero must create and follow certain rituals regarding death because those rituals help us. The bullfighter must have grace and must make his kills clean. He must face noble animals. He must put on his suit a certain way. Similarly, a fisherman shouldn't go out too far. He should respect the boundaries the fish have established for fishermen. Religion is helpful only in that it provides us with rituals. But religions are wrong when they promise life after death. The Hemingway man was a man’s man. He was a man involved in a great deal of drinking. He was a man who moved from one love affair to another, who participated in wild game hunting, who enjoyed bullfights, who was involved in all of the so-called manly activities, which the typical American male did not participate in. Throughout many of Hemingway’s novels the code hero acts in a manner which allowed the critic to formulate a particular code. He does not talk about what he believes in. He is man of action rather than a man of theory. Behind the formulation of this concept of the hero lies the basic disillusionment brought about by the First World War. The sensitive man came to the realization that the old concepts and the old values embedded in Christianity and other ethical systems of the western world had not served to save mankind from the catastrophe inherent in the World War. A basis for all of the actions of all Hemingway code heroes is the concept of death. The idea of death lies behind all of the character’s actions in Hemingway novels. When you are dead you are dead. There is nothing more. If man cannot accept a life or reward after death, the emphasis must then be on obtaining or doing or performing something in this particular life. If death ends all activity, if death ends all knowledge and consciousness, man must seek his reward here, now, immediately. Consequently, the Hemingway man exists in a large part for the gratification of his sensual desires, he will devote himself to all types of physical pleasures because these are the reward of this life. It is the duty of the Hemingway hero to avoid death at almost all cost. Life must continue. Life is valuable and enjoyable. Life is everything. Death is nothing. With this view in mind it might seem strange then to the casual or superficial reader that the Hemingway code hero will often be placed in an encounter with death, or that the Hemingway hero will often choose to confront death. From this we derive the idea of grace (or courage) under pressure. This concept is one according to which the character must act in a way that is acceptable when he is faced with the fact of death. The Hemingway man must have fear of death, but he must not be afraid to die. By fear we mean that he must have the intellectual realization that death is the end of all things and as such must be constantly avoided in one way or another. A man can never act in a cowardly way. He must not show that he is afraid or trembling or frightened in the presence of death. If man wishes to live, he lives most intensely sometimes when he is in the direct presence of death. The man has not yet been tested; we don’t know whether he will withstand the pressures, whether he will prove to be a true Hemingway man. It is only by testing, by coming into confrontation with something that is dangerous that man lives with this intensity. In the presence of death, then, man can discover his own sense of being, his own potentiality. Aside from death being a part of the concept of the code hero, there are certain images that are often connected with this view. His actions are often identified by certain definite movements or performances. He is often called a restless man. By restless is meant that he will often stay awake at nighttime and sleep all during the day. The reason for this is that for the Hemingway man sleep itself is a type of obliteration of the consciousness. Night is a difficult time for night-itself-the darkness of night—implies or symbolizes the utter darkness that man will have to face after death. Therefore the code hero will avoid nighttime. This will be the time he will drink or carouse or stay awake. If the old values no longer serve man, what values will? Hemingway rejects abstract qualities—courage, bravery, etc. These are all just words. For example, courage may involve a single act of courage. This does not mean that a man is by nature courageous. A man who has been courageous in war might not be courageous in some civil affair or in some other human endeavor. What Hemingway is searching for are absolute values, which will be the same and constant at every moment of every day and of every day of every week. Ultimately therefore, for Hemingway the only value that will serve man is an innate faculty of self-discipline. This is a value that grows out of man’s essential being, in his inner nature. If a man has discipline to face one thing on one day he will still possess that same degree of discipline on another day and in another situation. The Hemingway man is never a sloppy drunk. The man who cannot hold his liquor does not possess the proper degree of discipline. Don’t let’s talk about it. This means after he has performed some act of bravery he will not discuss it. Talking is emotionalism. It is the action that is important. If you talk about the act too much you lose the importance of the act itself. The same is true of talking about love. The Hemingway code hero is also a person of some degree of skill. It is seldom mentioned what the character does, but we do know that Frederic Henry has been a good architect. It is in the act of doing that which a man is good at doing that the code character finds himself. Rinaldi makes the statement that he only lives while he is performing an operation. Thus the Hemingway man detests people who are mediocre. There are enough people who are like the Hemingway hero that he will not associate with the ordinary or mediocre person. This attitude leads to the concept of the loyalty that a Hemingway hero feels for other people. He feels an intense loyalty for a small group of people. He cannot feel a sense of loyalty to something abstract, but as far as the intense, personal, immediate friendship is concerned, he is totally devoted to this smaller, this more personal group. In conclusion, the Hemingway hero is a man whose concepts are shaped by his view of death, that in the face of death a man must perform certain acts and these acts often involve enjoying or taking the most he can from life. He will not talk about his concepts. He is a man of intense loyalty to a small group because he can’t accept abstract things. He does not talk too much. He expresses himself not in words, but in actions. The Hemingway man is not a thinker, he is a man of action. But his actions are based upon a concept of life. Why would Hemingway create this new type of fictional character? Extremely well put, I commend you. Extremely well put commendment, I command you. Very nice blog. I am glad that I found it. To contribute I would also like to share this considerable source with others. Engliterarium © 2016. All Rights Reserved.